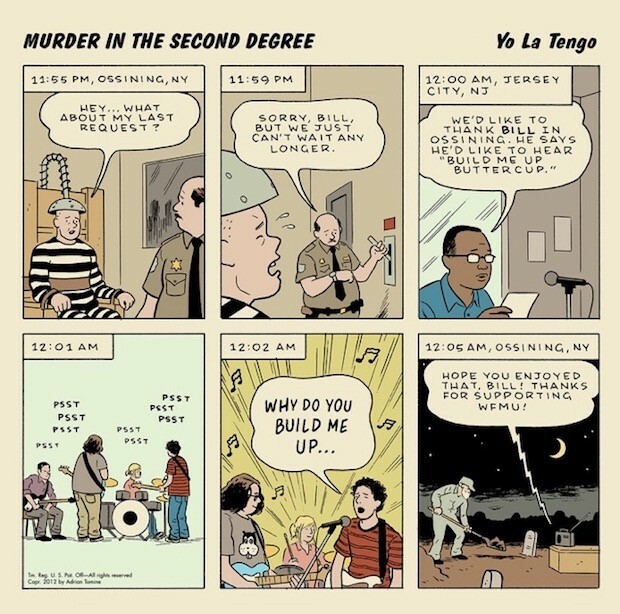 In 2006, Yo La Tengo released …Is Murdering The Classics, a compilation of covers that they performed on WFMU during their studio visits for fundraisers at the station. In a typical scenario, listeners would call in and request a song, and the band would attempt to play it relying on memory alone. Now, a decade later, they’re releasing another compilation of covers called Murder In The Second Degree. Per a post on their website, they aren’t letting on what tracks are included, and they mention that they compiled the songs that appear on it “years ago,” so more recent material will not be featured. Read their full post below and pre-order the release on CD here. So impressive is Adrian Tomine’s cover art that it is entirely possible that you, the prospective purchaser, are unfamiliar with what will unfold for the next 76 minutes should you be so rash as to part with your hard-earned money. For the last 20 years (and counting), Yo La Tengo, accompanied by cub reporter Bruce Bennett, have performed live on WFMU during their fundraising Marathon, and in return for listeners’ pledges of support, we have attempted to play their requests, with no prior knowledge of what those requests will be, and without utilizing any of the many web sites that provide lyrics and chords. We rely instead on a lifetime of listening and the forgiveness of our audience. Price is postage paid in the U.S.; shipping outside the U.S. is $9.45 per CD.